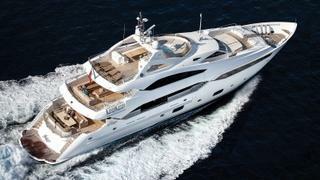 The 40 metre motor yacht Jelana, listed for sale by Torsten Sieckmann at Sieckmann Yachts and William Burns at Sunseeker London, has been sold with 360MYS introducing the buyer. Built in GRP by UK yard Sunseeker International, Jelana was delivered in 2011. A voluminous interior offers accommodation for up to 12 guests in six cabins consisting of a master suite, a VIP, two doubles and two twins plus two Pullman berths. Her large and comfortable main-deck saloon comes with ample seating, a bar and port and starboard sea balconies. Extensive deck spaces include a vast sun deck with a wet bar, spa tub, a GRP U-shaped seating area, sun pads and two retractable electrical sun awnings. Twin 3,138hp MTU engines give her a top speed of 25 knots, while a total fuel capacity of more than 28,000 litres allows for a maximum cruising range of 1,500 nautical miles at 12 knots. The course of her sale was anything but smooth for, soon after coming on the market in May 2015, Jelana ran aground off the coast of Corfu in Greece and had to be towed to a Greek refit yard. She is still undergoing major repair work and had a consequent large price reduction. Originally priced at €13.5 million, at the time of sale Jelana was asking €1,950,000.